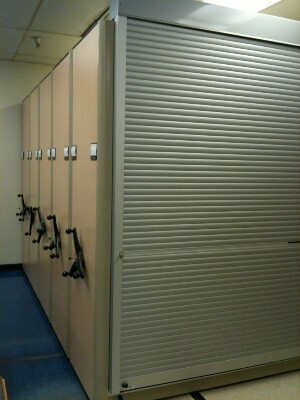 Rolling security doors provide a security system that is quick, simple and easy to both operate and install. During office hours, these lightweight doors roll up and out of sight, yet when closed and locked, they provide a solid aluminum wall to safeguard medical records and other personal health information. Because the doors are custom made, they may be affixed to existing shelves, record rooms, or whatever area needs to be secured. 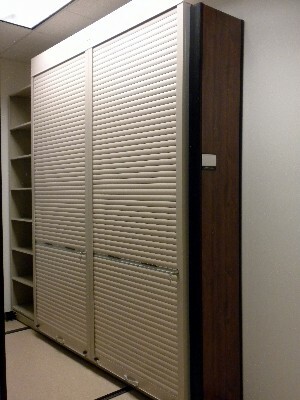 Protection security shutters make it possible to secure information in a medical office environment without having to relocate the existing medical records. Unlike most retrofit solutions available on the market today, the design of a rolling security door provides a solution that results in minimal to no loss of filing space. 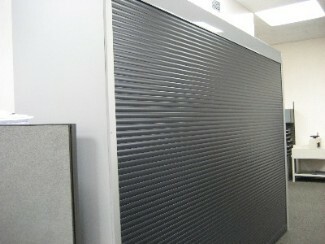 Each rolling door unit is designed for easy installation resulting in minimal down time for clients. The manufacturing design of the pre-assembled box incorporates a counter-balance spring to facilitate easy lifting, and provides a check against rapid closing speeds. This counter balance design incorporates metal slats that consist of two aluminum skins sandwiched with a core of plurethane foam thus providing lightweight strength. To eliminate unwanted resistance or misalignment that is found with other products, the alignment is accomplished by the installation of the pre-assembled box into the guide rails, thus ensuring a smooth transition of the stats from the box to the rail system. After each of the two guide rails are inserted into the pre-assembled box, the assembled unit is then attached to the existing cabinetry. The physical components consist of the side guide rails and a pre-assembled box, which houses the roll of slats. When the side guide rails are less than 76", the box will be 6-1/2" x 6-1/2" square. Longer guide rails will require a 7" x 7" box. Side guide rails measure 2-1/8" wide x 7/8". Drilling for guide rails can be surface drilling, on the 2-1/8" face, or recess drilling, on the 7/8" side. Locking is provided by a single key cylinder lock that is located in the middle of the base slat. The rotation of the key cylinder forces the internal locking bars to be pushed into the side guide rails. With file extenders from Protection Security Shutters, existing shelving can be easily modified for a hassle-free retrofit. 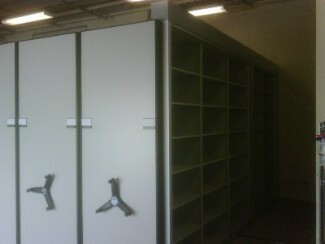 Because many existing folders extend out and in front of the shelving, file extenders provide the additional space needed for rolling doors to clear protruding files.